Think about how many times you’ve seen something along those lines pop up on your Facebook page or Twitter stream. How about your Instagram feed? You, like me, probably see it about a dozen times a day. Have you ever taken a moment to really think about it though? I mean, let the truth of that statement sink in. Every single person on this earth has the same 24 hour day. Rich or poor, worker or entrepreneur, everyone on every corner of the world has the exact same amount of time in a day. Let’s break down the typical day. You wake up, go to work, come home, go to the gym, eat, do the dishes, put the kids to bed, relax for a bit, go to bed. Rinse and repeat. Day in and day out until you retire in 40 years. Honestly, being an adult doesn’t leave much free time during the week. We really only have an hour of “free time” each day. So if we’re all given the same universal currency each day, what gives the successful people of this world an edge? The truth is that the elite of the world have found a hidden 25th hour in the day. That hour of free time? This is the 25th hour. The hour where most people zone out and the successful get some work done. The time where the side-hustler works on their dream. Some do it in the mornings before work, some do it when the rest of the working world is watching the latest crap on TV. Some do it on the train ride home every day. This is the hour where you can build your app. This 25th hour is where you can launch and scale your startup. This is where you go from side-hustler to CEO. If you’re skeptical about how powerful one small hour each day can be, lets do the math to prove just how big is. One hour a day, six days a week is six hours a week. That’s a full 24 hours every month. An entire day devoted to your dreams. Keep this up for a year and you’ll have added 312 hours to your life: A full 13 days. That is almost two weeks of non-stop productivity where everyone else is wasting their life away. 312 hours to build a second income. 312 hours to build your own app. 312 hours to become your own boss. 312 hours to grow your company. 312 hours to get ahead of everyone else that’s trying to do the same thing as you. This is the “secret sauce” of the worker turned entrepreneur. The side hustler that makes it big. The next billion dollar app CEO. And the best part? You have the same amount of time as everyone else in a day to start with. Now take advantage of it and get your app built in record time. 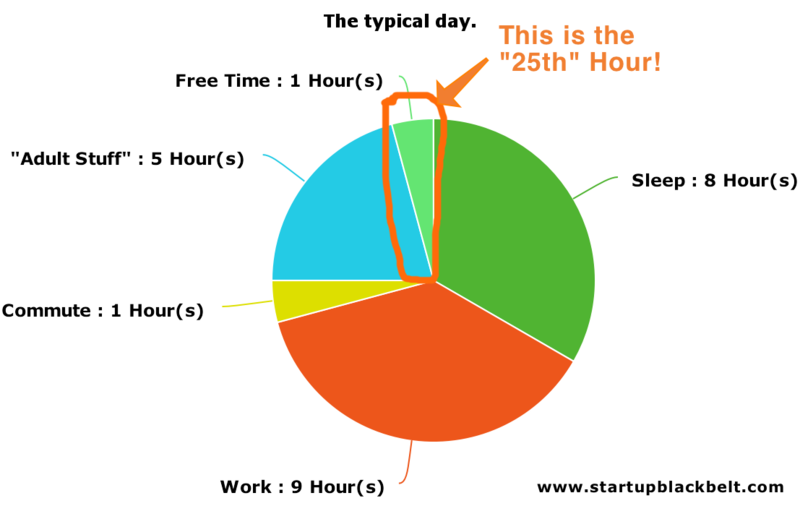 So what are you going to do with your 25th hour? Watch TV? Go to the bar? Hop on Facebook for the 10th time? Or will you work on your app idea that you’ve been thinking about for the last year?